Matti Kyllönen says that life has educated Kimi. The commentator legend remembers very well what kind of a baby-face sat behind Sauber’s steering wheel in 2001. Kyllönen says that now Räikkönen seems to be completely okay with himself. The Iceman doesn’t stress, not even over bigger things like possibly switching over to Red Bull. Even Kimi’s F1 team choices have gone into a more and more easy-going direction. Peter Sauber and Ron Dennis were uptight perfectionists. In Ferrari Kimi had more liberties, but the pressure around the F1-giant was huge. In Lotus the Iceman has been allowed to completely be himself. The team has turned Räikkönen’s persona into their resource, which has lifted up the Finn’s popularity in new heights. At the same time the team has got a raft of publicity. 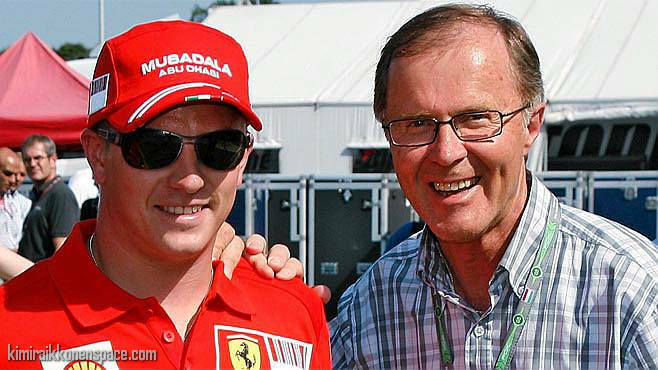 Kyllönen believes that the understanding from Lotus has also helped Kimi to grow. Räikkönen is also known for his straightforward attitude. Honesty is appreciated in the F1-world, where rumours and plotting are common. “Kimi has always been honest and even open in a specific way. He never talks bad about people behind their backs,” Kyllönen tells. And even if Räikkönen often is silent on the paddock, he definitely talks loud on the track. “A completely different person sits behind the steering wheel. In the team radio Kimi can even go down on the team management if needed. He is an aggressive fighter,” Kyllönen says. Yep. His definitely gotten better with age, always has been a fighter. To be honest I hope he stays at Lotus and serves them well. Kimi You are our champion. We want to see you 2013 world champion. Keep flying kimi.